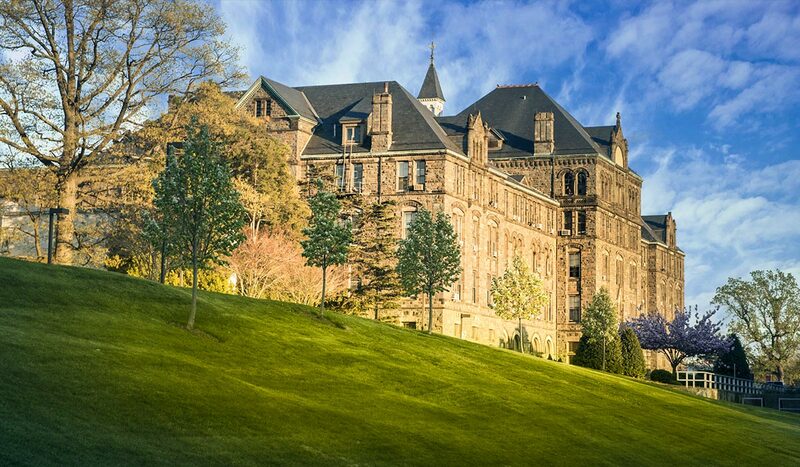 The Catholic University of America, founded in 1887 as a research-oriented institution, today stands among the leaders in undergraduate, graduate, and doctoral education in the United States of America thanks to the intellectual capital and faculty commitment across our 12 schools and 29 research facilities. We educate 7,000 students (nearly half are graduate students) on our 176-acre campus, located just north of Capitol Hill in Washington, D.C. In our 12 schools, you can choose from 45 doctoral programs, 78 master's programs, and more than 60 undergraduate programs. The School of Architecture and Planning at The Catholic University of America is the largest such school in the Washington, D.C., metropolitan area. Students utilize the nation’s capital as a laboratory and design in an exciting studio environment on campus. The pre-professional Bachelor of Science in Architecture degree is awarded after four years of study, as is an undergraduate joint degree program with the Department of Civil Engineering. The school offers several graduate programs: an accredited Master of Architecture first professional degree, a post-professional Master of Science in Architectural Studies, a Master of City and Regional Planning, and a Master of Science in Sustainable Design. By far the largest school at Catholic University, the School of Arts and Sciences encompasses 17 departments: anthropology, biology, chemistry, economics, education, English language and literature, Greek and Latin, history, library and information science, mathematics, media and communication studies, modern languages and literatures, physics, politics, psychology, Semitic and Egyptian languages and literatures, and sociology. Undergraduate programs emphasize liberal arts education with opportunities to major in 46 fields of study. Thirteen departments offer 30 concentrations at the graduate level. Ten departments have doctoral programs with 18 different concentrations. Six joint programs are available, combining master’s level study in arts and sciences with law or library science programs. The Tim and Steph Busch School of Business offers five undergraduate degree programs. All are based on sound theoretical and practical foundations, a global vision, and a strong work ethic to enable students to graduate with job-ready abilities. Our teaching and research excellence are inspired by the Catholic intellectual tradition. The three graduate degree programs offered through the School of Business focus on career-oriented skills with an emphasis on respect for the dignity of the human person, and the positive role of business as forces for good in communities, institutions and society. The School of Canon Law at Catholic University, the only school of Catholic canon law in the United States, offers ecclesiastical degrees authorized by the Vatican. The school’s courses of study familiarize students with the law of the Catholic Church and prepare them for the professional practice of canon law in dioceses and other ecclesiastical structures. While the primary focus of coursework is the Code of Canon Law for the Latin church, attention is given to the Code of Canons of Eastern churches. The application of canon law requires not only skill in legal interpretation but also a broad grasp of the historical, theological and sociological factors contributing to its development. Founded in 1896, Catholic University’s engineering program became the School of Engineering in 1930. The school offers research-based education, with undergraduate and graduate programs in biomedical, civil, electrical and mechanical engineering. Special offerings include a five-year joint bachelor’s/master’s degree, a pre-med track in biomedical engineering, a dual-degree program leading to degrees in architecture and civil engineering, construction and environmental engineering concentrations in civil engineering, and an undergraduate education abroad program. The school supports and encourages paid summer internships for all engineering students. A study abroad program with Hong Kong Polytechnic University has also been established, offering students wider global experience. Founded in 1897, The Catholic University of America's Columbus School of Law is distinguished as a pioneer in clinical legal education, offering one of the nation’s broadest ranges of clinical experiences to students. In addition, the law school is widely recognized for special programs in communications law, law and public policy, law and religion, law and philosophy/culture, securities law, and comparative and international law. Catholic University’s law school ranks among the highest in the nation for graduates who choose to practice public service or public sector law. Alumni are also well represented in government and private practice. The Benjamin T. Rome School of Music, Drama, and Art seeks to educate, engage, and energize its student body in dynamic programs that integrate classroom learning with real world performance, production and understanding of artistic expression, research, and teaching. Our variety of undergraduate and graduate majors allows each student to find his or her niche and to develop and grow into professional artists, scholars, educators, and critics. The School of Nursing is ranked among the best nursing graduate programs in the nation and is distinguished for preparing graduates for leadership in a changing health care environment and developing a commitment to lifelong learning and service. The school is known for its commitment to the advancement of nursing science and practice through its clinically oriented research, its educational initiatives focusing on advancing the care of vulnerable populations, and its successful pipeline projects to increase nursing diversity. Students receive the opportunity to be part of the metropolitan Washington, D.C., community through targeted clinical learning opportunities; exposure to government, public and health policy advocacy and development; international activities; and special events. Founded in 1895, Catholic University’s School of Philosophy features one of the nation’s oldest and most extensive academic programs in the field of philosophy. As one of only three university philosophy schools in the U.S., it offers bachelor’s, master’s, licentiate and doctoral degrees. The school also offers undergraduates a pre-law program. The school provides courses in every major period of the history of philosophy, on every significant contributor to the field, and in the most important philosophical disciplines. It is especially known for its work in classical and medieval philosophy, its contributions to the study of 19th century German philosophy and the advancement of the phenomenological movement. Established in 1979, Metropolitan School of Professional Studies offers adult students opportunities to complete professional development and degree programs while continuing employment. Students can attend evening and weekend classes, as well as study through online courses, while concentrating in such fields as business management, education studies, human resource management, information technology and social sciences. College Level Examination Program tests are given on campus to assist adults in obtaining credit for what they have learned outside of formal classrooms. The school also offers certificate programs and corporate training for business and professional groups as well as master's degrees in management and human resource management. The National Catholic School of Social Service is committed to educating professionals who address the basic needs of all persons. With fully accredited master’s and baccalaureate programs and a legacy in doctoral social work education since 1936, the school is recognized for graduates who provide leadership and service in public, private, and corporate social service delivery and educational systems. Six research centers facilitate research studies that are empirically based and relevant to real-world social work practice and policy in the areas of aging, children and families, health and mental health, community development, spirituality and international social development. Founded in 1887 — the year that Pope Leo XIII gave his approval to establish The Catholic University of America — the School of Theology and Religious Studies is one of three ecclesiastical schools at Catholic University. It is internationally renowned for educating scholars for the academic community and for its professional training of lay and clerical leaders who serve the Catholic Church throughout the United States and the world. The school offers ecclesiastical, civil and professional degrees on the graduate level. Our faculty guide and administer the curriculum in theology and religious studies for Catholic University's undergraduates and for graduate programs as well as specialized programs in Hispanic ministry and in the history of religions. Founded in 1917 as the Sulpician Seminary, Theological College was officially established by Vatican decree in 1937 as the seminary of The Catholic University of America. Today, in collaboration with the bishops of the United States and Catholic University’s Schools of Theology and Religious Studies, Philosophy, and Canon Law, Theological College prepares future priests for a life of service to parishes and dioceses across the United States. The seminary offers a balanced, holistic formation program, focusing on the human, spiritual, intellectual, and pastoral dimensions of formation. Theological College assists seminarians in the task of vocational discernment and in preparation for priestly life and ministry.